It's The Ship's first foray into China is going to be big. With the cruise festival set to embark on its first voyage this June, excitement surrounding its line-up has been building up since the festival was first announced. 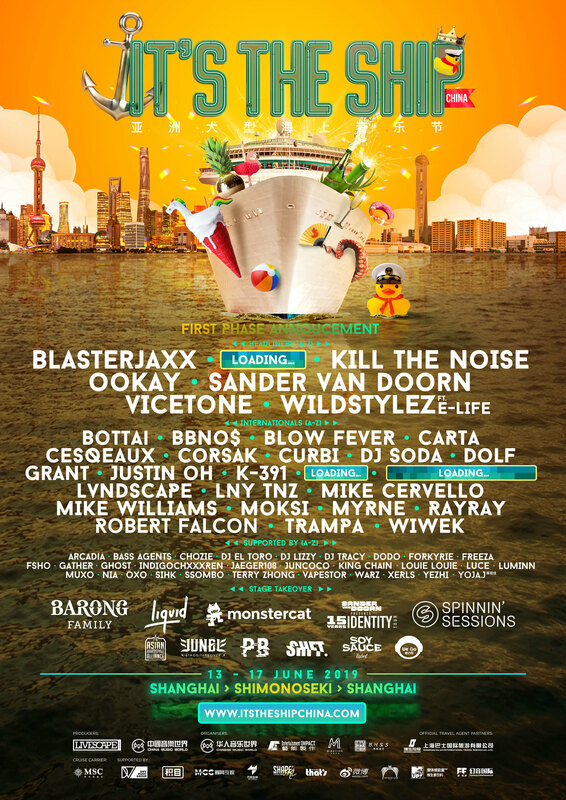 Now, we have been given our first glimpse at a stacked line-up that includes the lines of Kill The Noise, Blasterjaxx, Sander Van Doorn, Ookay, Vicetone, Wildstylez, Cesqeaux, Moksi, LNY TNZ, Ray Ray, Sihk, Dolf, Mike Cervello, Myrne, Wiwek, Trampa, DJ Soda and more. And that's just Phase 1. Apart from the acts announced, it was also revealed that several key labels in the dance music scene will be participating in the festival for stage takeovers. These labels include the Barong Family, Spinnin' Sessions, Liquid, Monstercat and more. It's The Ship China is scheduled to take place from 13 to 17 June 2019. Cabins are available now and can be booked here.